Two Tickets For... Predicts the 89th Academy Awards Winners! Andrew: Hello dear readers! As you may know, the 89th Academy Awards are airing tonight on ABC. You may not know it from our lack of reviews the past year, but we DO still see a ton of movies and we've seen most of the Oscar nominees this season. So that said, Sarah and I carved out a bit of time this afternoon to go through all of the categories and their nominees, picking who we think will win and who we think should win. For each category we'll list the nominees and then our picks. For some awards we'll write up little blurbs explaining our thought process. Let's see how well we do tonight! Thoughts: It's really looking like La La Land will wind up running away from the majority of the awards tonight, and it's a fantastic movie no doubt. But Hell or High Water was the film we saw in 2016 that we thought was the best, period. Chris Pine, Ben Foster and Jeff Bridges all give career-best (or near career-best) performances, you can cut the tension with a knife throughout the film, and it's a very acute look at the hardships many Americans deal with on a daily basis - with a cinematic approach to how two brothers decide to face their personal hardships. If we had votes they would go towards David Mackenzie & Taylor Sheridan's crime Western. But La La Land is obviously winning. Thoughts: The only one of these five films we didn't see was Hacksaw Ridge, and any other year I think there might be a real fight to be had here, but La La Land should be such a steamroller that it'll be a big surprise if Chazelle doesn't walk away the winner. To be fair, 3 out of the last 4 Oscars have seen a Best Picture/Best Director split, but we're confident Chazelle's sharp eye and strong hand over the musical he's worked so long on will be awarded. Synopsis: Called back into action with the promise of clemency for her prior crimes, Selene (Kate Beckinsale) returns to her Coven to train a new army of vampires as they look to defend themselves from Marius (Tobias Menzeis), a dangerous and organized Lycan leader. Not all is as it seems however, forcing Selene and David (Theo James) to seek out a distant Coven in the hopes of surviving - and possibly ending - the long-running Vampire/Lycan war. Andrew: Hello dear readers! Yes it's true, we are BACK with a review for the first time in a few months. Quite honestly we've been looking for an inspiration to get us back into our movie reviewing groove again. 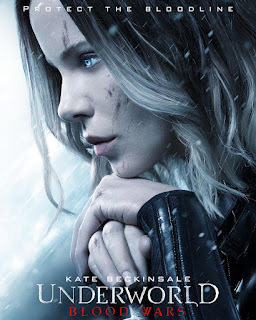 Then we started seeing commercials for Underworld: Blood Wars, the latest entry in the Kate Beckinsale-led Underworld franchise and we just knew we needed to review it. How could we not when the first FIRST review we did five years ago here on Two Tickets For... was for Underworld: Awakening? And so we're back! Sarah, in general we actually quite enjoy the Underworld movies for what they are: stylish and ridiculous action films about the war between vampires and Lycans (the series' term for werewolves). Now that we've seen Underworld: Blood Wars, what did you think of the latest entry in the series? Sarah: Well it was definitely something! This new installation to the franchise was a little lacking for me. While we were sitting there I started to think that there was a lot of talking happening. They kept going back and explaining everything that has happened over the course of all the films. For some reason it just seemed like a lot of talking. When I go see the Underworld movies I go for the action, not the deep intellectual stimulation. While there was some action, it just was lacking in comparison to the previous films. Am I being too critical? What did you think? Synopsis: Following the events of Batman v. Superman: Dawn of Justice, the U.S. government builds a task force of incarcerated "metahumans" as a backup plan should Earth need protection from evil forces. When one of their members turns into an evil force, the rest of the squad is sent into action. Sarah: Hello dear readers! It's true, we are back with a brand new movie review for you! It's been almost on year to the day since our last review and we wish we could say that something exciting had happened to cause the hiatus, but really life just got in the way. 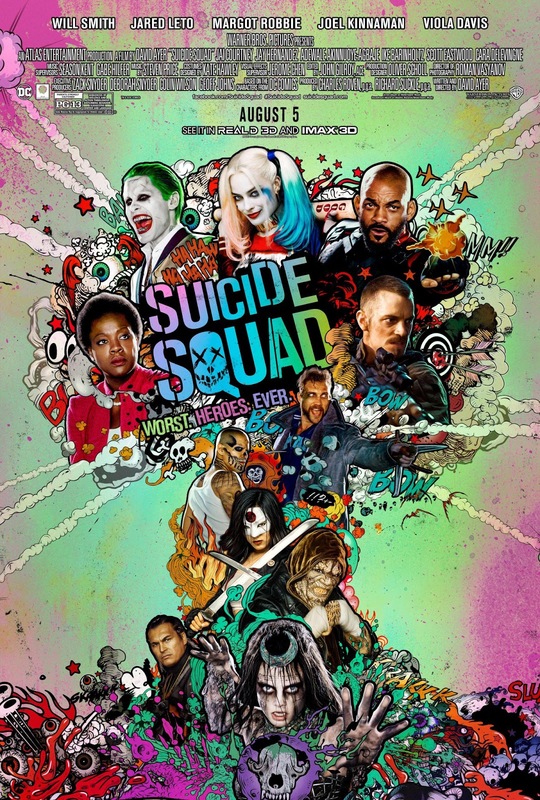 We can't promise that there's going to be a ton of new content or that we will begin posting regularly again, but for now we wanted to do a quick little review on a movie that we had been looking forward to for a long time: Suicide Squad, the newest entry in the DC Extended Universe. 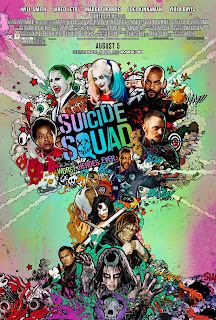 Suicide Squad was a comic book film that we had been anticipating for while now. There's a new Joker (Jared Leto, Dallas Buyers Club), Harley Quinn (Margot Robbie, The Wolf of Wall Street) making her feature film debut, and a whole host of new characters (at least to me). We were totally in. Now that we've seen it, and you've seen it twice now Andrew, what are your initial thoughts? Andrew: This is a bit of a tough one for a couple reasons. First and foremost, we were REALLY looking forward to this movie. The trailers did such a phenomenal job of getting us pumped for it. Secondly, this is not a good movie. It just isn't. There are good things in it, but as a fully formed movie it isn't good. And I'd say you can argue whether or not it's even a "fully formed" movie. S: I will agree with you that this was not a fully formed film. With the abundance of "Huh?" and "That's not how that works" moments it was easy to walk away with a sour taste in my mouth. But there were things about this movie that I really enjoyed! 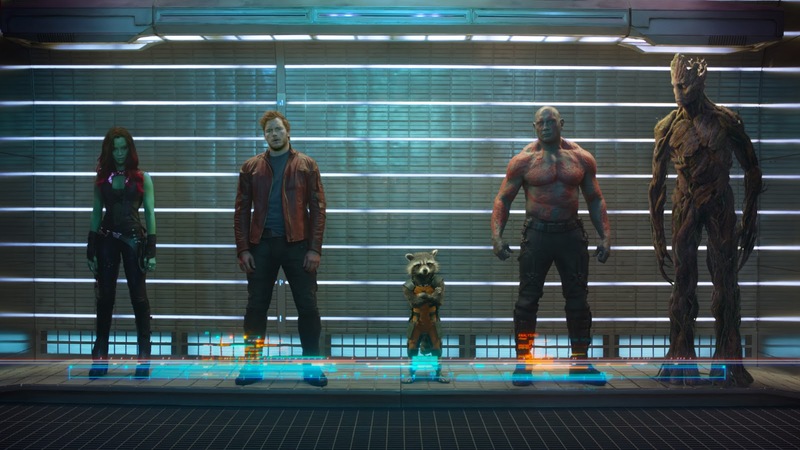 The music, for starters, was reminiscent of Guardians of the Galaxy with fun (and sometimes funky) beats to go with different scenes. It got the audience pumped, albeit for a short amount of time, to see what was going to happen next. And the characters that writer/director David Ayer did flesh out were done so with an obvious love for those characters. Harley Quinn and Deadshot (Will Smith, Men in Black) were given lots of care and attention, making them endearing to an audience in the hope of masking the fact that other characters were given the shaft. Even the Joker (who was highly publicized in the making of this movie) was only given a handful of scenes to really show off the fact that, no, this is not the same Joker you remember. Synopsis: A group of young scientists invent a trans-dimensional teleportation device and gain superpowers following a catastrophic trip to another dimension's planet. These scientists and their civilian friend who was roped into the trip must then band together to save the planet from one of their own group. Andrew: Hello dear readers! Sarah and I have been on an extended blogging hiatus due to a fairly busy summer with some weird work schedules for the both of us, but we were drawn out of said hiatus thanks to a film that we were morbidly curious to check out: Fox's new Fantastic Four reboot. It's directed by Josh Trank, who made a name for himself with 2012's Chronicle - a superhero film that we reviewed positively back in the first year we did this blog - and stars Miles Teller (Whiplash), Kate Mara (House of Cards), Michael B. Jordan (Chronicle) and Jamie Bell (AMC's Turn) as Reed Richards/Mr. 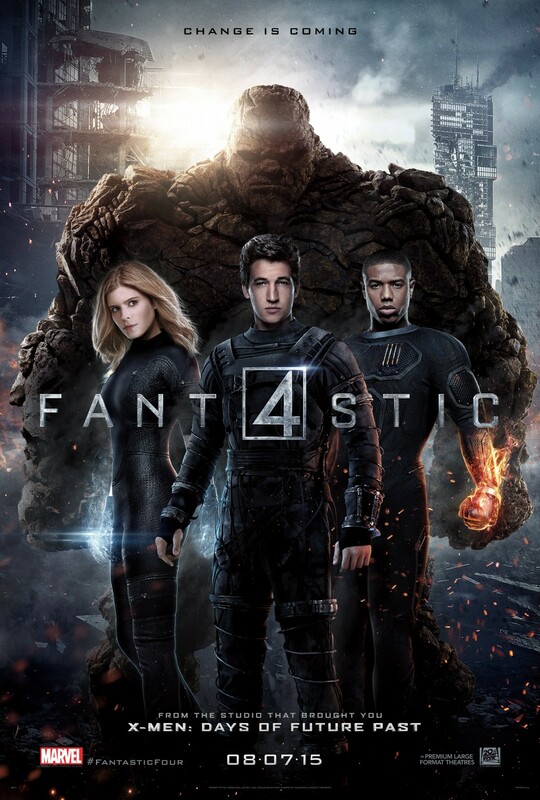 Fantastic, Sue Storm/The Invisible Woman, Johnny Storm/The Human Torch, and Ben Grimm/The Thing, respectively. Oh, and Tony Kebbell, who played Koba the chimp in last year's Dawn of the Planet of the Apes, plays Victor von Doom/Dr. Doom this time around. So Sarah, let's get to it. This reboot has been critically panned and it's already a box-office flop, having earned only $26 million in its first weekend. Just for comparison, the 2005 and 2007 Fantastic Four films that starred Jessica Alba and a pre-Captain America Chris Evans earned $52 million and $58 million in their respective opening weekends. A: Yeah. That's one of the primary reasons this new film even got made, as Fox waited until virtually the last minute to put it into production to hold onto their rights, and there's an unreleased, incredibly low-budget Fantastic Four movie from the 90's that was made for the same reason. Synopsis: A group of friends are terrorized during a group Skype session by someone claiming to be the spirit of their friend, Laura Barns (Sossaman), one year to the day of her committing suicide following an embarrassing video of her going viral and the bullying she enduring afterwards. Andrew: Hello dear readers! Now that we're making a more concerted effort to posting reviews (in conjunction with our schedules actually allowing us to), I'm going to try and do more Alone in the Dark reviews. If you're not familiar or don't remember what those are, Alone in the Dark reviews are when I watch and then review a horror movie all by my lonesome because Sarah doesn't like them. A couple of weeks ago I saw the indie-hit It Follows before she got up here to Connecticut and will be posting that review later this week. Today I will be reviewing Unfriended, one of numerous horror offerings coming out this year produced by Blumhouse Productions (producers of films like Paranormal Activity, Insidious and The Purge). Originally screened last year at Fantasia Festival under the name "Cybernatural," Unfriended is a play on the found footage genre, telling the story of a group of friends who are terrorized during a group Skype session by someone/something claiming to be the spirit of their friend Laura. Oh, and the film takes place one year to the day of Laura committing suicide after she was mercilessly abused online after an embarrassing video of her was uploaded to YouTube. 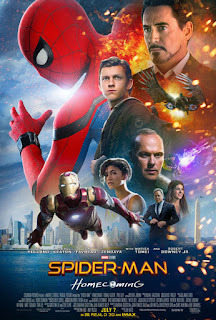 Synopsis: Tony Stark (Downey, Jr.) discovers a way to create an artificial intelligence he dubs Ultron that could potential protect the world so The Avengers can retire. When Ultron (Spader) becomes sentient, it immediately decides to best way to protect the world is to rid it of mankind…starting with The Avengers. Andrew: Hello dear readers! Our sincerest apologies for the long time between reviews. Simply put things have been crazy for the Kecks the past year or so. We moved from Connecticut to Georgia and then back to Connecticut in the span of 15 months. We each worked full-time jobs that had some pretty strange hours that limited our ability to see as many movies as we would've liked, as well as cut into our recording/transcribing reviews time. But now we're back in Connecticut and our schedules have opened up to allow for more movie-seeing and reviewing! And what better way to make our comeback then by reviewing the presumptive summer box office champ? Sarah: Yes! Tuesday night we were fortunate enough to be invited to an advanced screening of Marvel's Avengers: Age of Ultron thanks to our good friend Kevin. 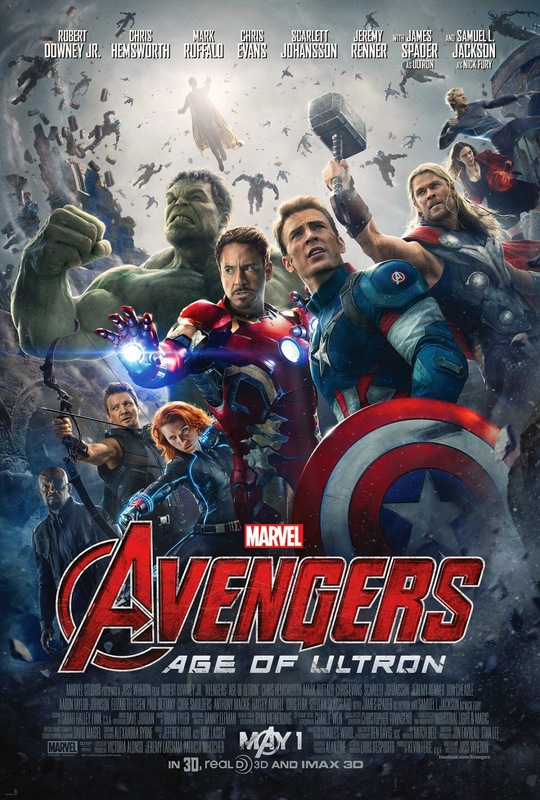 AOU brings back all of the Avengers from the previous Marvel Cinematic Universe films as they band together to fight a sentient robot named Ultron that Tony Stark creates through artificial intelligence in an effort to create a sort of "shield for the world." Andrew: Hello dear readers! With arguably the busiest part of the year for my and Sarah's day jobs, we're able to turn a focus back to the blog like it deserves. We're hoping to start seeing more movies now and getting some reviews up, especially now that the Oscars have happened, somewhat marking the official beginning of the new year in movies. With that said, we want to present the movies we are looking forward to the most in 2015. The way we went about this, Sarah and I each ranked the top 15 films we were looking forward to respectively. Then we took our individual rankings and combined them to find an average score for each film that got listed on at least one of our lists and listed every film by the cumulative ranking they received. For reference we have embedded trailers for the films that have them available online. Without further ado, we present Two Tickets For...'s 20 Most Anticipated Films of 2015! S: I’m more curious than anything about this movie. I'm an unabashed Marvel Cinematic Universe fan, so I'm looking forward to another tale in the series. 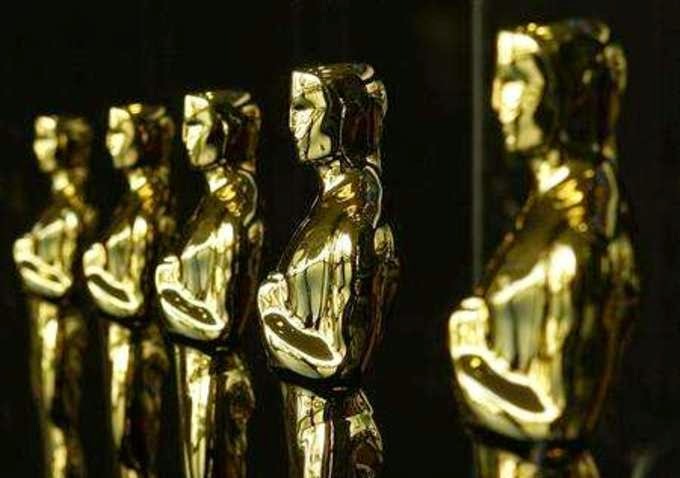 Two Ticket's For… Predicts the 87th Academy Awards! Andrew: Hello dear readers! We're cutting it close to the wire but Sarah and I are here with our official predictions for tonight's 87th Academy Awards! We'll put the meat of the awards (Picture, Directing, the acting categories and screenplay categories) right at the top along with some quick breakdowns of why we made those picks, then we'll have all the technical categories, documentaries, short films and animated films after those without comment. So let's get to it! A: Both of the screenplay categories are tough contests this year with a number of good movies, or movies that at least have a lot of love for them. Starting with Adapted Screenplay, I immediately cross off Inherent Vice, The Theory of Everything and American Sniper. I don't believe any of those have the fervent love of voters to really take this award, whereas The Imitation Game is a strong script that gives its main players plenty to chew on, and Whiplash is just a really strong script that tells a great, fresh story and gives J.K. Simmons and Miles Teller tons to work with. I'm giving the edge to Whiplash primarily because Chazelle pulled double-duty as writer and director for his first true feature film, and I think people will want to recognize a fresh new talent like him. Sarah: I'm going to have to go with The Imitation Game in this category! While it does come down to those two for me as well, too, I think that most of the love for Whiplash is going toward the supporting actor, not necessarily the screenplay. Tough category but I think I'm definitely sticking with The Imitation Game. A: Fun fact for anyone who didn't already know this, but Whiplash was placed in the Adapted Screenplay category because of a strange ruling by the Academy. Chazelle originally wrote a full-length version of his screenplay that would become the Oscar-nominated film we know and love. But in order to gain funding for a feature-length version, Chazelle made a short film version based off the original script he wrote, which even won a prize at Sundance two years ago. Because of the short existing, even though the screenplay for what became the full-length version with Teller and Simmons was written first and then adapted into a shorter version, the Academy determined the short to fall under their definition of "previously produced or published material" for the Adapted category. Crazy, huh? A: Original Screenplay is the toughest of the two, and maybe one of the toughest categories of the whole night. All five of these movies have legit claims to the award, IMO. But we can probably cross Foxcatcher and Nightcrawler off because they're too dark. The Grand Budapest Hotel could win because voters might finally want to give Wes Anderson an Oscar, but I think this one is down to Boyhood and Birdman. Warranted or not, I think I'm going to cross Boyhood off because some factions of voters could think Richard Linklater had an advantage of writing the movie over the course of 12 years. Birdman also hits the voting bloc right in the sweet spot as it's about actors and gives all the main players great stuff to work with. I'm going with Birdman here. S: Once again, I agree and think it is between those Boyhood and Birdman as well. We just watched Boyhood last night and while I wasn't impressed with it, I basically don't think that it is really getting the love that Birdman has gotten in this category. The director, Iñárritu, is on fire with the awards season and while we'll touch on his film's chances in other categories later, for now I'll say I think he wins for Original Screenplay. Andrew: Hello dear readers. Long time, no post. We know. We've been positively awful about reviewing and posting other content on the blog the past few months. And it's not that we're not seeing films - because we are - but we've been pretty busy with our days jobs to the point that the time it takes to record, transcribe, edit and post the reviews like we'd like to feels exhausting. We'll try to be better as the new year continues, considering there are a TON of great-looking movies that we're excited for this year. That all said, with 2014 in the rearview mirror now, Sarah and I wanted to take the opportunity to look back at all fifty-some films we saw that were released last year and talk about which ones were our favorites. Unlike in previous year's, because of our lackadaisical job at reviewing all the films we saw this year, our criteria is simply that we had to have actually seen the film. We've included a few movies that we didn't post reviews for. So without further ado, in alphabetical order after the jump, here are my and Sarah's respective list of our Top Ten Favorite Films of 2014!